The Jeep Liberty Limited Urban Terrain is just Okay for its price. On the surface, it appears quite unique with its attached steering wheel, beeping horn and sound system that works with an iPod, iPhone and MP3 player. However, we recommend that you look past this flashy exterior as under the hood, this may disappoint. In addition, some past models have been recalled because of a faulty tire, so it's important to make sure you have not purchased one of these older model numbers (see the list of numbers below). This sporty-looking Jeep stroller (manufactured by Kolcraft) handles pretty well over rough terrain because of its large, air-filled tires. However, it is NOT designed to function as a jogging stroller. Its strengths are ample storage space and above average maneuverability. We scored this stroller very low in overall ease-of-use, a 4 of 10. Even though it looks fancy and fun, it under-performed in most of our metrics. This stroller folds one-handed, unless you want to click in the tricky lock, then you'll need both hands to do the job. It will self-stand pretty securely, though may fall forward while you're folding it. Unfolding it is very easy, but with its wide, tall, and bulky shape, it is a real chore to to lift into a trunk or take onto public transportation. The seat reclines in many different positions with min-max angles of 31-68 degrees, and can carry a child up to 50 pounds and/or 40", but it's just not that comfy with its minimal padding and hard back. The air-filled tires offers some comfort but without additional suspension, it's still a pretty bumpy ride. The sunshade is small, difficult to adjust, and doesn't provide for ventilation. There is a peek-a-boo window. Storage is quite nice with its extra large storage basket and two removable side cargo bags. It's very easy to access the basket from the front and back, but is inaccessible once folded. Although the removable kids tray with 2 cup holders houses a plastic "I play" steering wheel, its position is too far for baby to engage when harnessed. Sitting at a cafe with this stroller may not be ideal as it has a large footprint and may make more noise than your child. Attached "I drive" toy includes car sounds, horn, and music. For that matter, the iBaby sound system on the parent tray doesn't work well, in our experience. 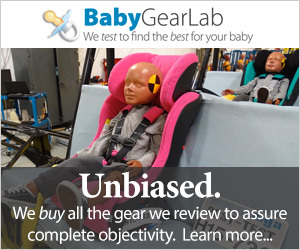 Urban Terrain offers an "iBaby" feature which we did not rate highly mostly due to its poor sound quality. Although this Urban Terrain stroller looks the part, it is NOT designed as a jogging stroller, but rather as a stroller that can navigate fairly well over many different terrains, both on and off road. Although long, the Jeep Liberty is fairly easy to push; it comes equipped with grooved 12.25" inflatable tires, with a front wheel that can swivel but also lock for easier and smoother travels. Pneumatic 12.25" wheels provide suspension while the swiveling front wheel can lock for maneuvering on rough terrain. It's pretty clunky to use, though. Because of its length, it was hard to maneuver through sharp, tight corners. We also found ourselves often kicking the back of the stroller, especially when going down stairs. In our safety tests, the Urban Terrain scored a 6 of 10. The double foot brakes feel stiff when you try to release them, and though there is quite a bit of play, it is quite hard to actually move the stroller when locked. The stroller's padded "Grow-with-Me" five-point harness has a stiff buckle and some difficult adjustments. The shoulder straps are padded, but are difficult to adjust with the padding on. The waist straps are also not easy to adjust with the way they are threaded. Lastly, the crotch strap is not adjustable. This stroller scored just above average in our sideways tip over test. It scored very well in our backwards tip over test, requiring 33 lbs 13 oz on the back handlebar (with a 20 lb baby in fully upright seat) to tip the stroller backwards. Keeping in mind that the Terrain is JPMA Certified ( Juvenile Products Manufacturers Association) and has a one-year warranty, some of the models have been recalled for a faulty tire. On June 19, 2013, the CPSC (Consumer Product Safety Commission) documented in its recall notice that, "the inner tube of the tire on the stroller can rupture causing the wheel rim to fracture and fly off as a projectile, posing a risk of bodily injury and property damage." For more information and relevant model numbers, we have included this article that further explains the aforementioned hazard: "The Kolcraft strollers involved in the recall were made in China and have model numbers starting with JL031, JL032, JL034, JL035 or JL036. Affected strollers were manufactured between June 2010 and September 2011. 'Jeep' is printed on the side of the stroller and the front of the stroller tray." For those who may already have one of these stroller models, contact Kolcraft at (800) 453-7673 from 8 a.m. to 5 p.m. ET Monday through Friday or online at www.Kolcraft.com, then click on "Safety Notifications" for more information. We found this stroller to have a lot of flex in the frame, and cheaply made accessories, including the less than optimal sound system. When folded the Terrain is bulky. This was the heaviest stroller we tested in this review of 21 strollers at 31 lbs 9oz. It scored a 2 of 10 in Weight/Folded Size because it is so heavy, bulky, and large when folded. Nonetheless, it can accommodate a child up to 50 pounds and/or 40". Many brands of infant car seats are compatible with this Jeep stroller as well (see specification chart), so it will work for the early days of infancy as well. However, we feel like a infant car seat frame stroller would be easier and more lightweight for this purpose. It took us 17:43 (min:sec) to set up the Jeep stroller; with a set up score of 3 of 10. This was slightly longer than the average time, and documentation was below average. The rear wheels utilize cotter pins for attachment which is complicated and the front wheel requires two wrenches for removal, which is impractical and outdated to say the least. Parents who desire an economical, eye-catching stroller with plenty of storage space and decent maneuverability over differing terrain may enjoy this stroller. But if you like this stroller, we think you'll really like the Best Value Award-winning Baby Trend Expedition, for its real jogging capabilities, its lower list price (by $70), and overall higher quality and performance. And if you're set on that sound system, Baby Trend is the only other stroller manufacturer in this review that offers a version (the "Expedition LX") that's equipped with MP3 speakers on the parent tray, which work with most MP3 players, Apple® iPod® models, and Apple iPhone and still costs less than the Jeep Liberty Urban Terrain. The Jeep Liberty Limited Urban Terrain is a pretty good value because of its $200 list price point, hundreds of dollars below many other sporty strollers; but overall it just didn't impress us at all, and made us ask ourselves: Why did Jeep ever allow Kolcraft (this stroller's manufacturer) to use the very valuable their name and branding? If you absolutely love traveling with music at your fingertips, especially over long distances (on or off road) with baby and lots of storage in tow, and don't want to spend a lot of money on a stroller, then consider the Baby Trend Expedition instead. It's important to note that you will need 4 AAA batteries, which are not included, in order to operate the iBaby sound system. In addition, you will need 2 AA batteries to operate baby's child tray electronic wheel toy. The Jeep Liberty Urban Terrain can accommodate 15 different car seats, including those from Baby Trend, Chicco, Cosco, Graco, Peg Perego, Safety 1st, and Britax. Kolcraft manufacturers 9 other strollers, including two double strollers, plus one car seat carrier. Compared to all the Jeep strollers, the Urban Terrain is in the middle price range. Here's a very quick video that gives you a basic feel for this stroller.